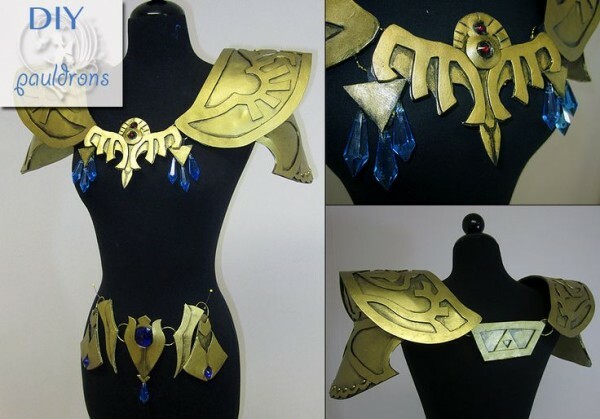 DIY Princess Zelda Armor « Adafruit Industries – Makers, hackers, artists, designers and engineers! The Legend of Zelda games have been around for nearly 30 years. And even though Link is often highlighted as the main character, Zelda is really popular. I see multiple cosplayers interpret her dress and armor different ways – I’ve seen elegant ball gowns based on Zelda’s dress, warrior Zelda, etc. Firefly Path designed her own pattern for Zelda’s armor based on what’s in the game but with some personal touches. The pattern represents her personal vision of what the armor should look like. She made the armor from craft foam. Lay the pattern on top of the craft foam sheets and trace around shapes, then cut them out. Using hot glue, attach raised details to each section. (Detail placement is indicated on the broken lines of the pattren) Exclude the pieces that are placed over the gems. Cover each section with Elmer’s glue & let dry. This will give the acrylic paint a good base to stick to. Using hot glue, attach the bottom of the pauldron to the middle section. Squeeze a bead of glue to the center to set in place, then hot glue the sides bending it to fit. Score the top of the middle section with a fine tip then fold it inward, hot gluing it down to create a lip. Cut a strip of dark felt to hot glue to the inside. Make sure there are a few inches hanging over. The reason I add felt to the inside is to create a strong base to add the top of the section to. It also serves as a filler in the seam. Read the rest of the tutorial and see several photos at Firefly Path. 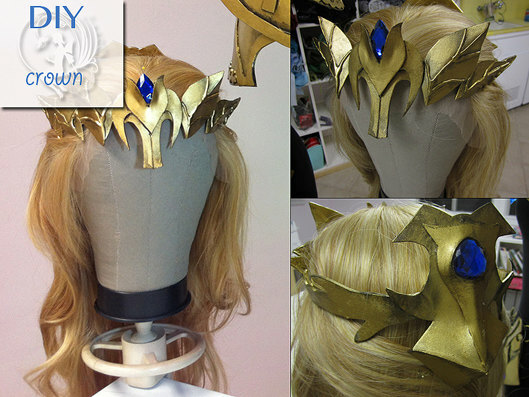 Firefly Path’s Princess Zelda armor pattern is available for purchase and instant download at Etsy.